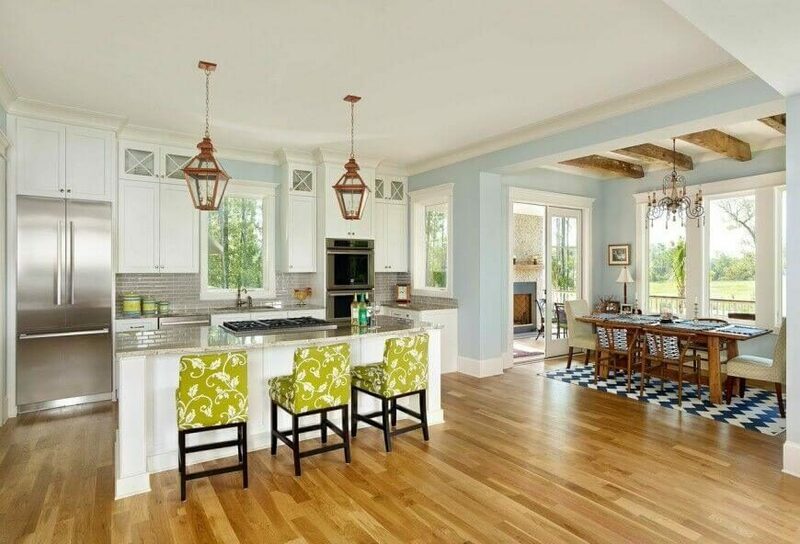 Welcome to our gallery featuring 25 images of spectacular kitchen islands with a stove. While we have covered a multicolored galaxy of kitchens here before, we enjoy taking the time to narrow in on particular strains once in a while. 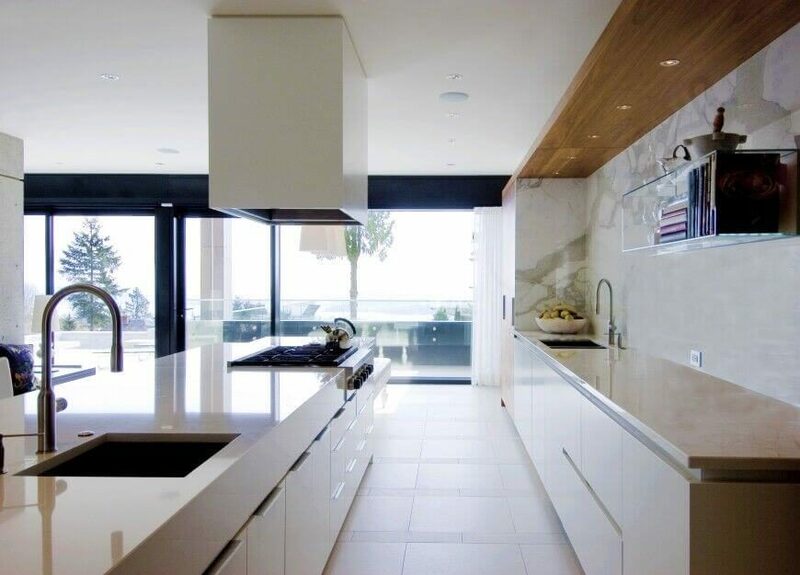 Today, our focus is solely on kitchens that are equipped with islands featuring a built-in range. Kitchen islands have come along way from their humble roots as portable utility stands, flourishing as the centerpiece of many modern kitchens. These islands often features expansive countertops, with abundance space available for in-kitchen dining, courtesy of a set of conveniently placed bar stools. As the sizes grew, the feature sets expanded. You’re more likely than not to see an island with a built-in secondary or even primary kitchen sink, adding utility and novelty by placing a central function of this room in a fresh place. The countertop on an island offers a more open space than those backed against a backsplash or shaded beneath cabinetry. By adding a dedicated cooking surface to the island, its usefulness is expanded greatly. Now food can be prepared in a wide open space and moved into place for serving without effort. Even more than this, ventilation is improved, as well as lighting, in most cases. 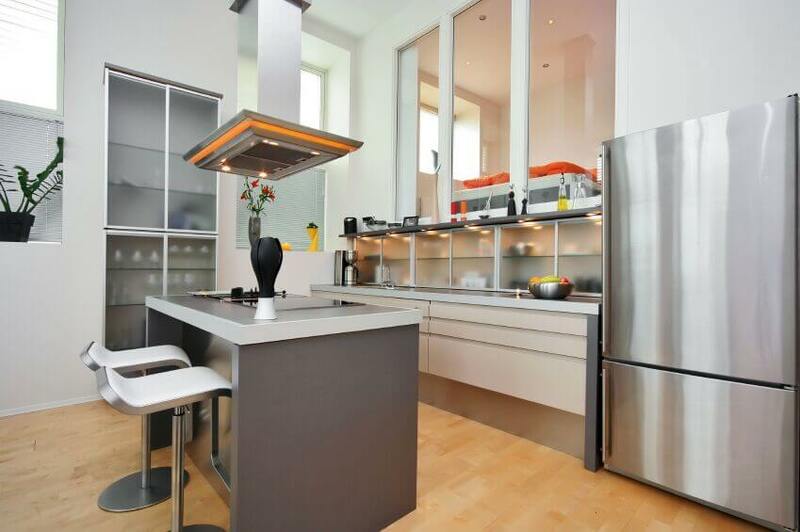 With a stove built into your kitchen island, the cooking food can simply be seen better! The islands themselves appear in a wide array of styles and sizes, clad in anything from rustic wood to ultra-modern sleek stainless steel. 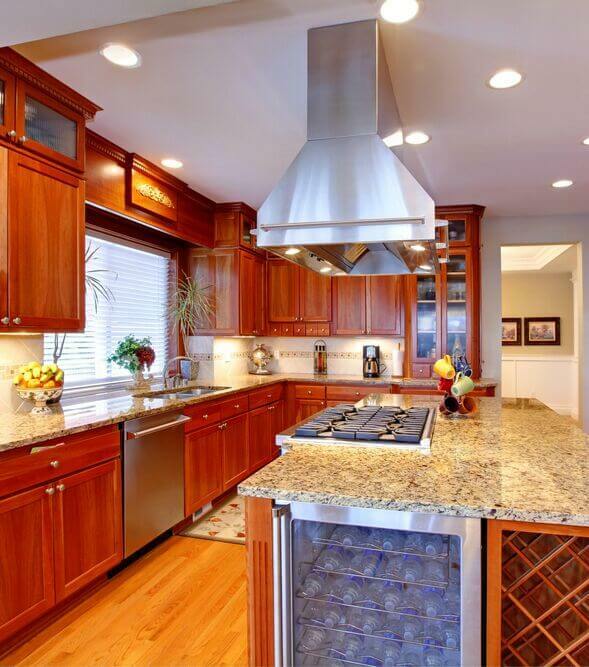 Countertops can be found in rich wood, steel, quartz, granite, and of course marble. 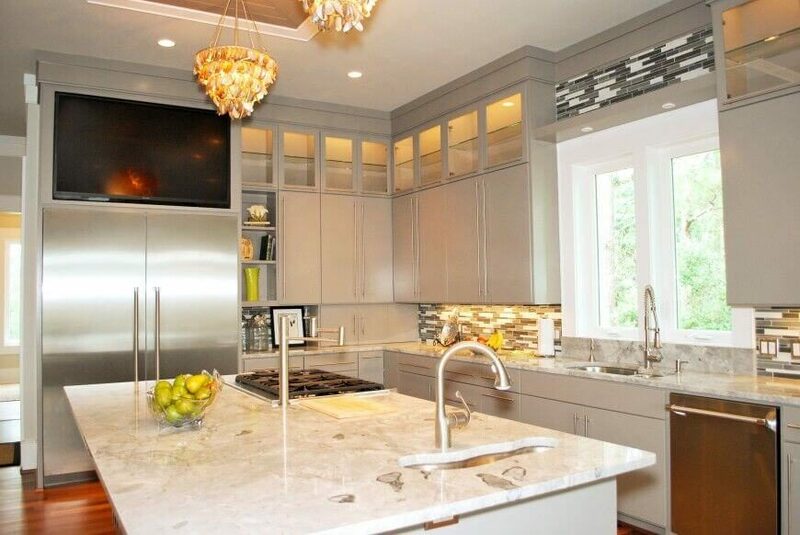 Our top featured kitchen, pictured above, was designed by Gregory Phillips Architects. You can see more of this home here. One of the best aspects of having a functional island with a built-in stove, is that it makes the kitchen a more social and open space. You can be busy cooking without having your back turned to family and friends! This sleekly modern kitchen appears brightly lit via wraparound glazing, with light hued tile flooring, walls, and countertops. The lengthy minimalist island features a full secondary sink as well as a large stainless steel gas top range. 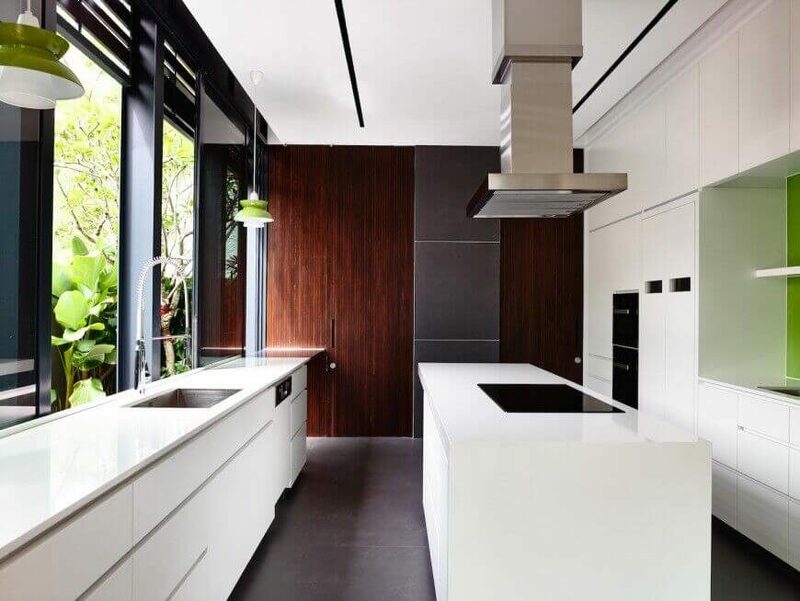 In another minimalist and modern kitchen, we see a rich array of textures, including sleek white cabinetry and countertops, charcoal tile flooring, and rich wood detail on the far wall. The white island features a sleek black cooktop beneath a stainless steel hood vent. See more of this home here. Designed by HYLA Architects. In an open-plan home with a kitchen at center, the island defines this space. With stainless steel countertops in contrast with white cabinetry and natural wood wall details, the island houses discreet gas stove top, with dials built right into the siding. 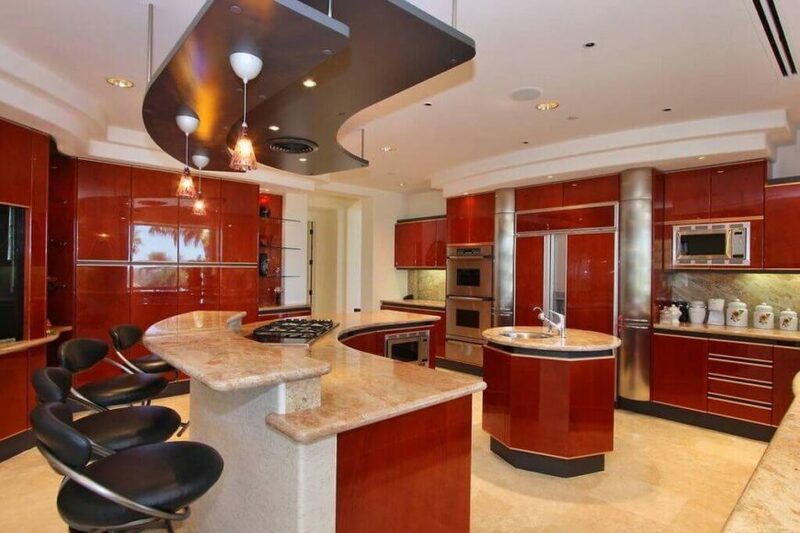 Here we have a large, very open design kitchen centered on a large white island with granite countertops and plenty of island dining space for the trio of upholstered bar stools. White cabinetry and stainless steel appliances contrast with sky blue walls and rich hardwood flooring. 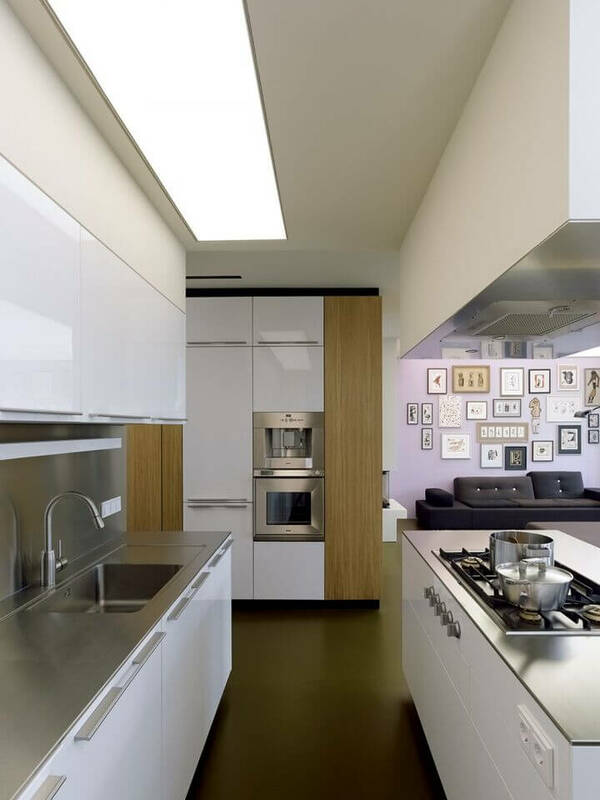 This brightly lit, open, yet slim kitchen features pristine white cabinetry and rich wood walls. 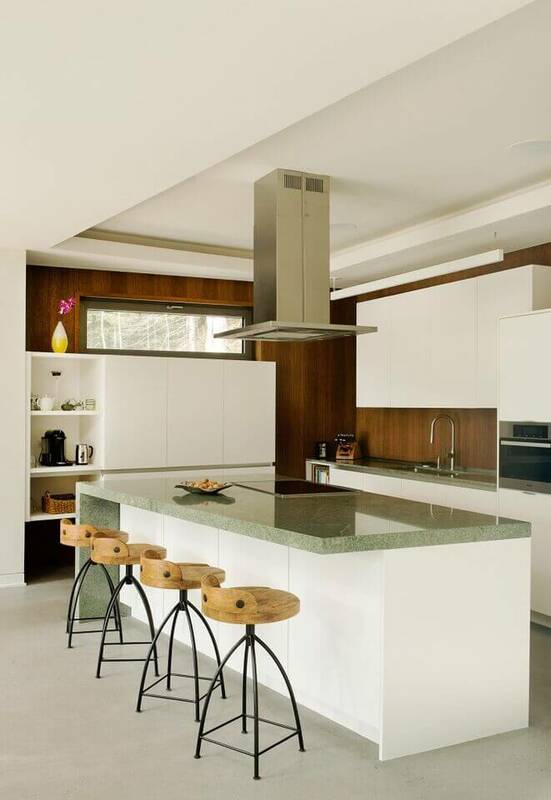 The massive island features thick slab marble countertop and a built-in smooth surface range. See more of this home here. Designed by Boom Town. This highly textural kitchen features dark tile flooring, stainless steel cabinetry, and a large island at center with an abundance of features, including a raised tier for dining at right. The island also features a full sized built-in sink and stainless steel stove. See more of this home here. Designed by: Jamie Bush & Co. 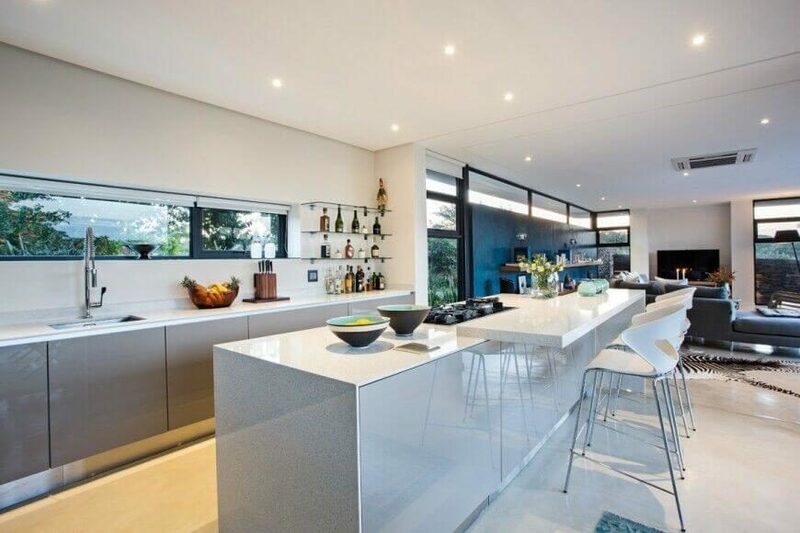 Beneath a high, slanted ceiling, this open plan kitchen is lit via full height windows at right. 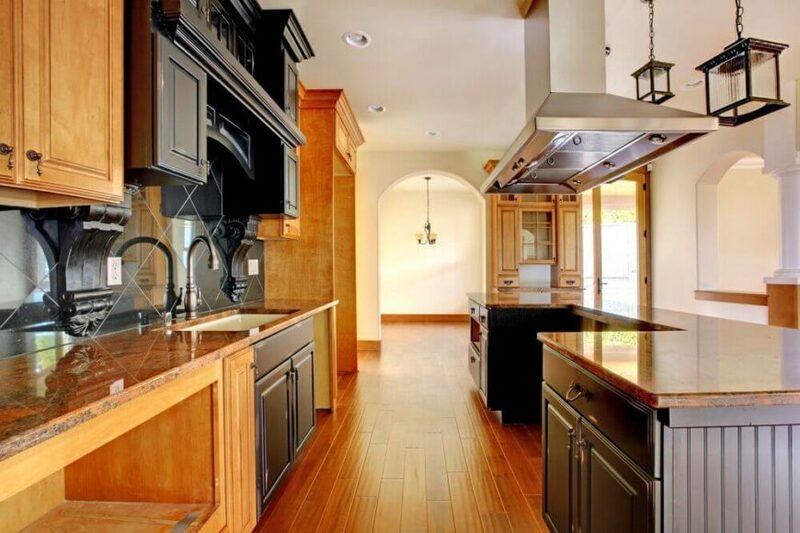 Rich natural wood appears on the cabinetry, ceiling, and island, which also houses a built-in stove. See more of this home here. Designed by 2e Architects. In a sprawling open-plan space that includes living and dining areas, this kitchen is defined by a lengthy white-topped island. The island houses not only an upper tier for dining, but also a built-in gas stove. See more of this home here. Designed by Metropole Architects. This traditional but open-design kitchen features high contrast between deep toned hardwood flooring and pristine white cabinetry and ceiling detail. The massive island features a black countertop and built-in sink and full size stove with gas range. 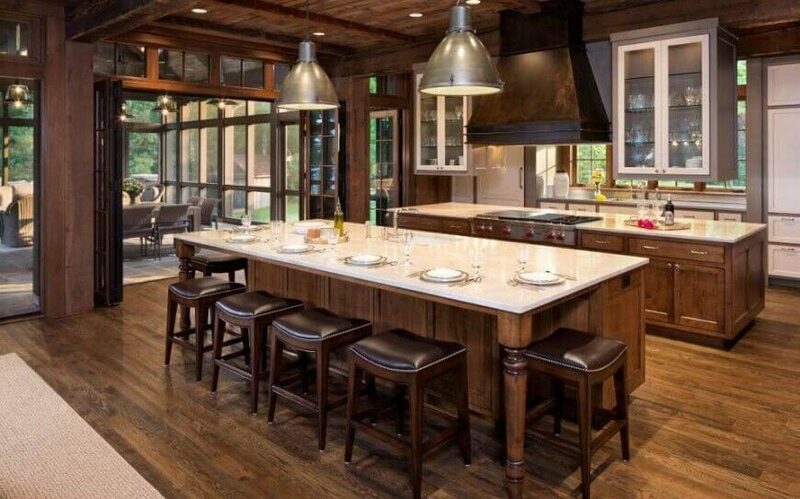 In a sprawling rustic-styled home, we find this large kitchen awash in rich natural wood tones. A pair of immense islands feature matching white marble countertops, with one housing a large stainless steel stove and the other featuring abundant dining space. 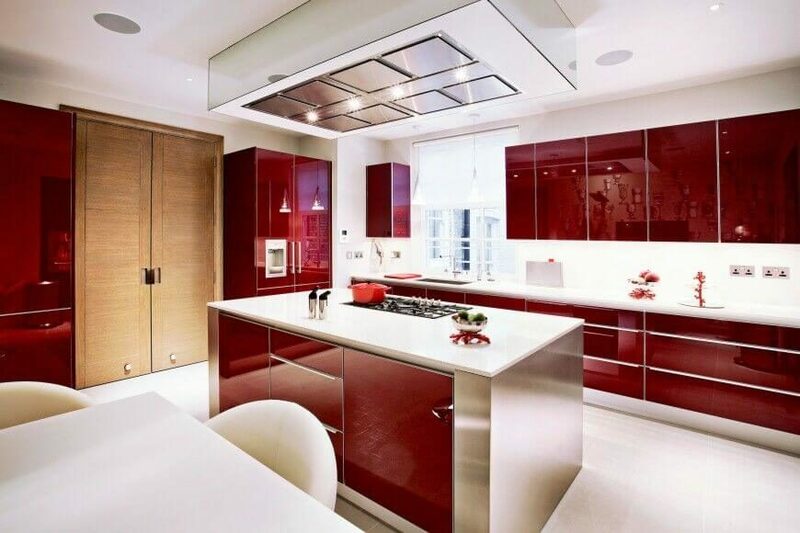 This ultra-modern kitchen bursts with color and contrast, with bright red cabinetry and dark countertops. 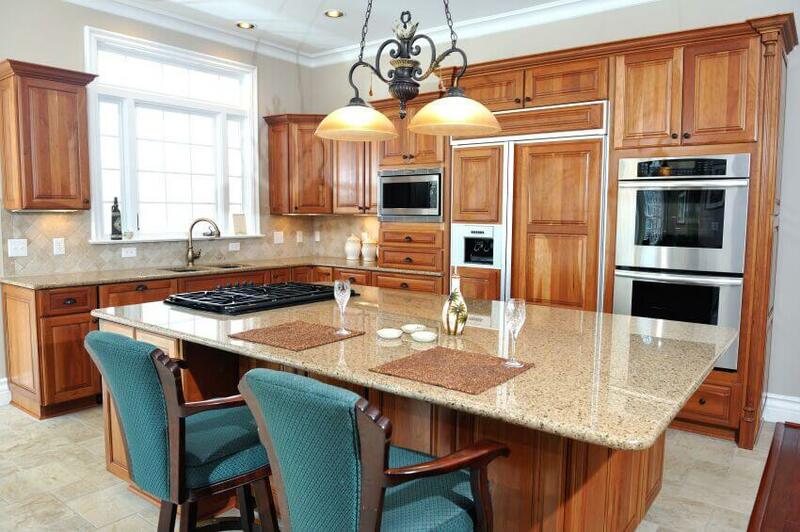 The large island features dual sinks and a built-in stove top. Another high contrast kitchen, this example features dark natural wood cabinetry contrasting with white countertops and lighter hardwood flooring. 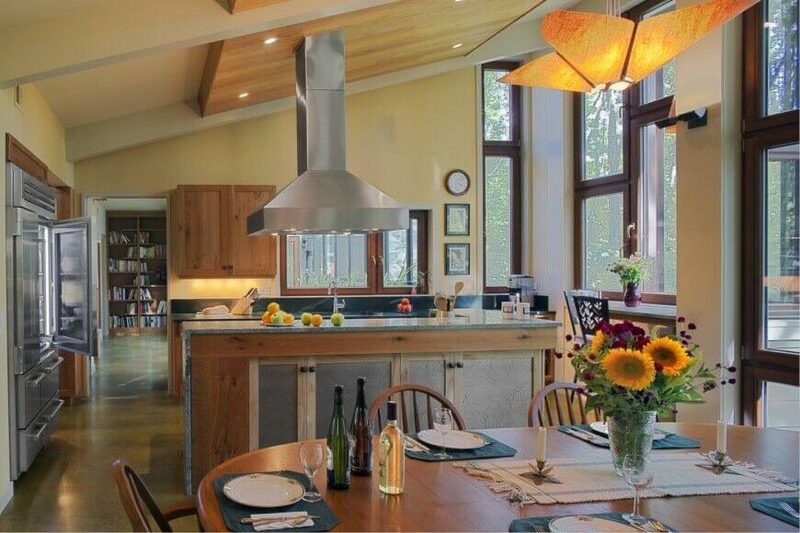 The two-level island features raised dining space and a built-in stove. In an incredibly sleek and reflective modern kitchen, the white-topped smaller island design stands at center, commanding attention with a surplus of cabinetry and stainless steel body. The built-in range sits below a uniquely modern hood vent with built-in lighting. 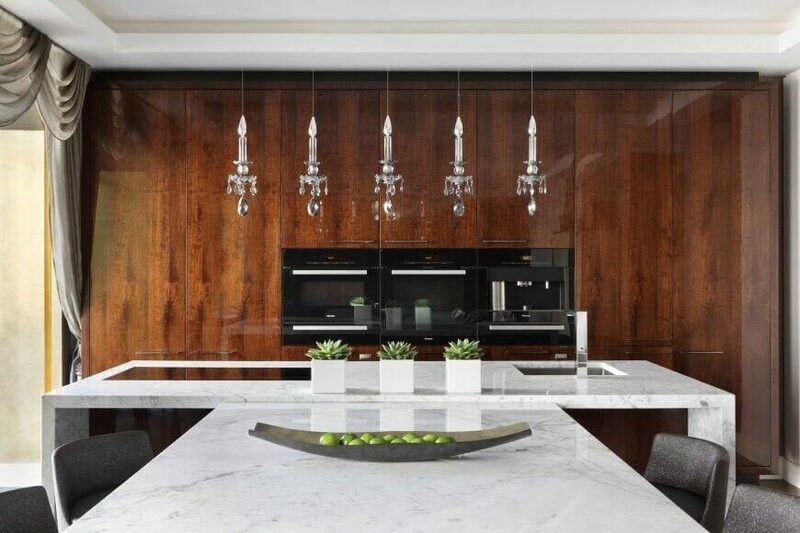 An elegant open-plan space features sharply modern appliances built into the glossy hardwood cabinetry at center. The large T-shaped island features marble countertops and built-in sink and minimalist range top. In this cozy high contrast kitchen, we see light grey cabinetry over hardwood flooring, centering on an island with marble countertops and an unorthodox sink int he foreground. The island also features a built-in gas stove. 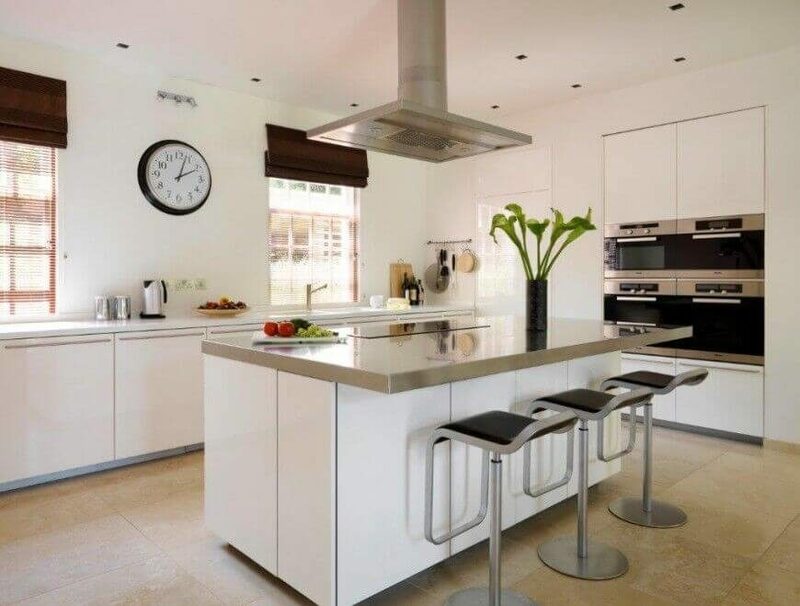 In an expansive, minimalist open-plan home, the kitchen is defined by its large island and sleek white cabinetry. The island features abundant storage, plus space for dining and a built-in stove. 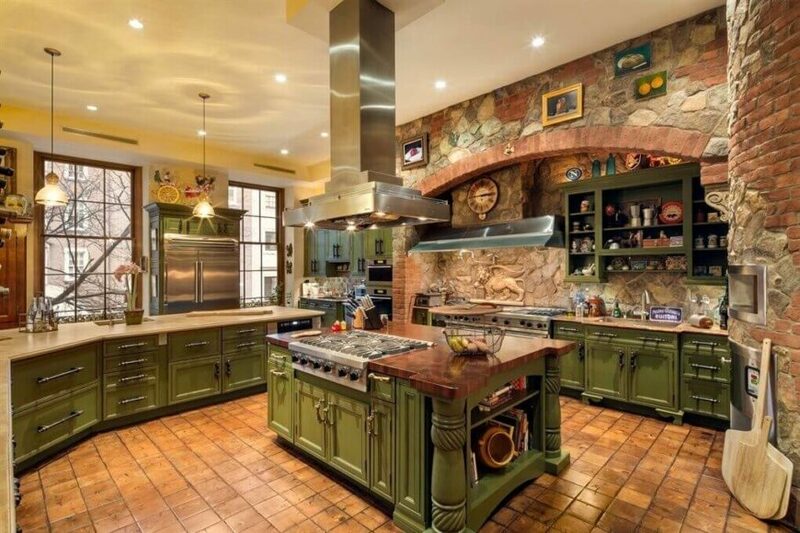 In this massive rustic kitchen, green painted wood cabinetry and stone walls compete with brown tile flooring in an abundance of textural detail. The large island at center features thick polished wood countertop and built-in stainless steel stove. This modern kitchen is highlighted with bold red wood cabinetry throughout, contrasting with beige tile flooring and granite countertops. A smaller circular island boasts a sink, while the larger C-shaped island features a built-in range and upper tier for dining. Many kitchen islands with a stove don’t offer much additional counter space; however, the above example has plenty of additional counterspace. This lengthy traditionally styled kitchen is centered on a massive island, featuring built-in cooler and wine rack and light granite countertop. The built-in stove is stainless steel, matching appliances throughout the room and contrasting with rich natural wood cabinetry. 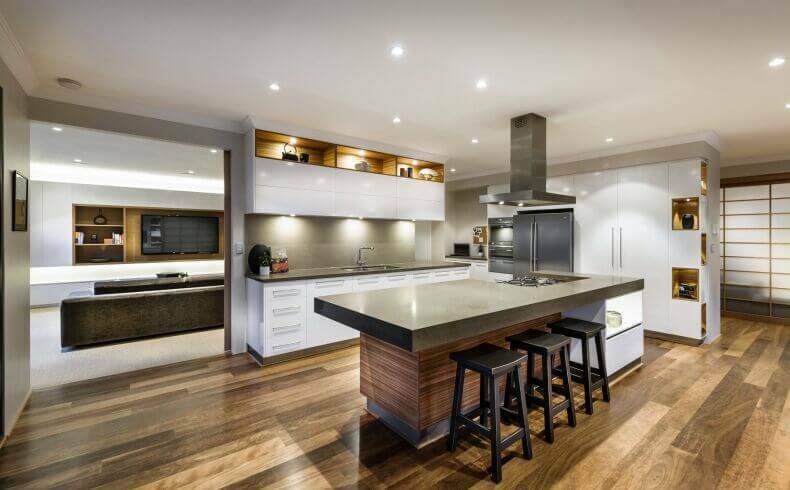 This lengthy kitchen is flush with warm natural wood tones, from the flooring on up. 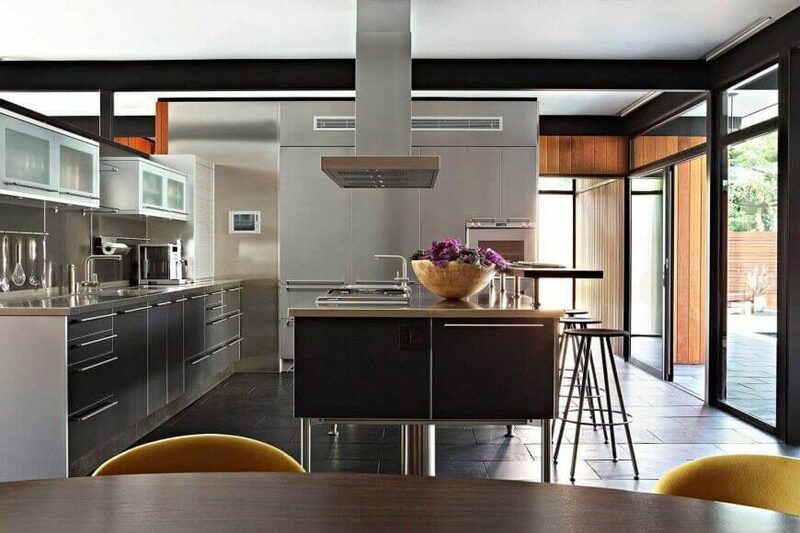 The immense U-shaped island at right features a cavity for the placement of a full size stove and range, right below the large stainless steel hood vent. 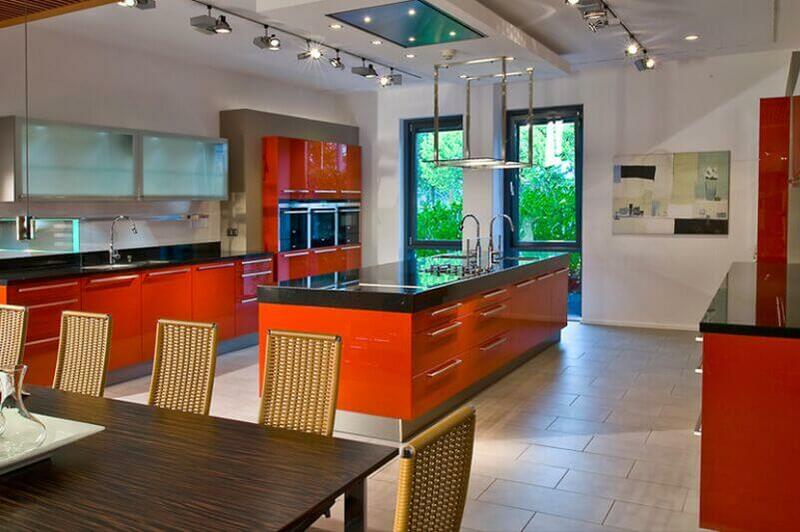 Here’s an especially bright kitchen, awash in varied textures, from light hardwood flooring to smoked glass cabinetry. The large minimalist island features a grey countertop with flat surface range, with a unique range hood wrapped in orange stripes overhead. In an ultra-modern kitchen boasting stainless steel countertops and large format tile flooring, the lengthy island in black features a large gas range and full sink built-in. 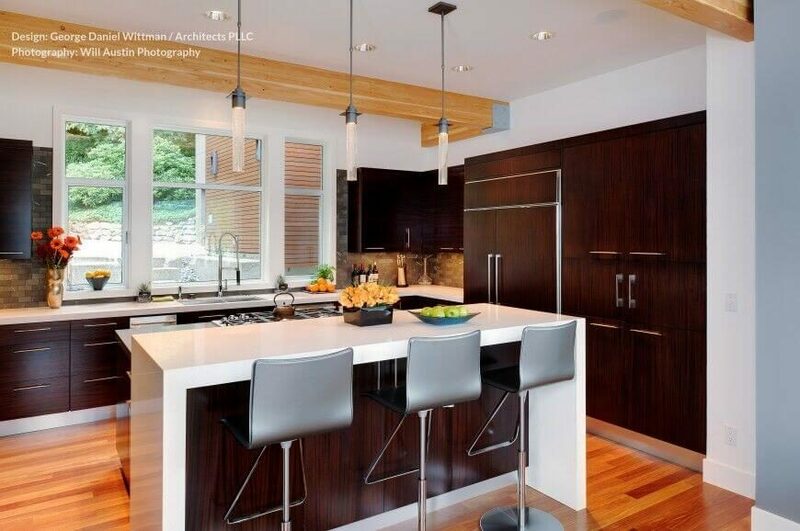 Dark stained minimalist cabinetry completes the picture. 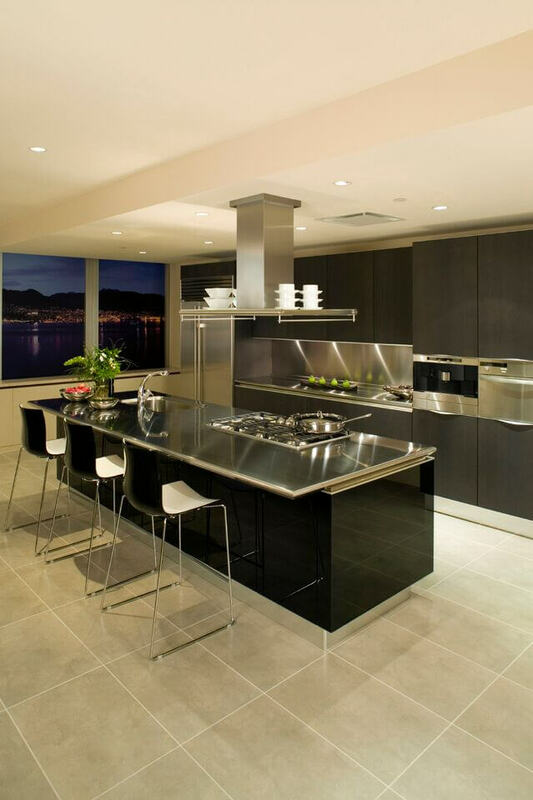 This sleek, high contrast modern kitchen features glossy black cabinetry juxtaposed against light natural wood countertops and flooring. 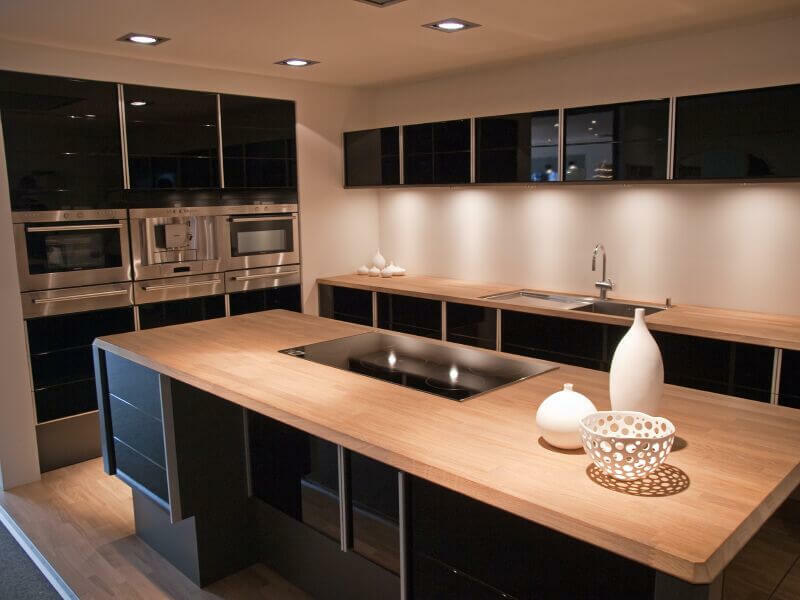 The large island boasts a glass-flat range, matching the black hue of the cupboards. The expansive island in this kitchen features a light granite countertop with plenty of dining space and a range in jet black. The natural wood cabinetry throughout adds a warm, traditional tone to the space.